color: SOME SOLDIER'S MOM: Truth Hurts?? First, WTF is "the LA urban policy unit"?? Is that ACORN?? You get zip -- except European and UN references -- when that term is googled... European and UN... that's about right. 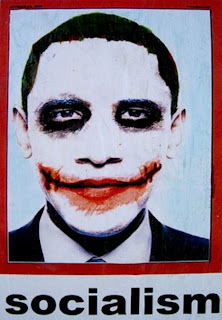 And I didn't hear anyone on the left say it was mean-spirited when such images or worse were made of our previous President. And in the case of this poster, I figure it's because the truth hurts, doesn't it?? For those libtards who are offended, please read the First Amendment to the Constitution in regards to FREEDOM OF SPEECH. Yah. He is too cute. I can't wait until my grand baby arrives. whew, I can tell you are STEAMED. Good job giving the woman some grief. About the Joker thing. Vanity Fair did the exact same thing to President Bush. Good god. You can't criticize the man at all without having to fend off that charge. These legislators are fooling themselves about this movement. Expect some incumbants to lose come 2010. Let's hope the public memory isn't too short term.